Do you wonder what it would be like to have a wood deck in your yard in Beckemeyer, Illinois? You could sit and relax on it after a hard day in the office. You could grill a meal or enjoy a game night with your family. Or, you could entertain friends, hosting a marvelous get-together, birthday party, or another joyful celebration. There is virtually no limit to what you can do or how you can enjoy your outdoor living solution. When you partner with Chesley Fence & Deck, you don’t have to just imagine what it would be like to own a wood deck. We can build one in your yard in Beckemeyer in the size and configuration that would work best with your lifestyle needs and personal preferences. And, our highly-skilled and trained deck builders will make sure to install it with the care and precision it takes to ensure that it looks its best year after year. 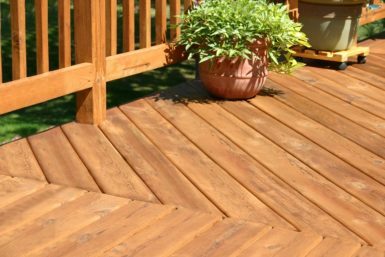 Treated lumber – This is our most affordable decking option, and it can be sealed and stained. Premium cedar decking – Our premium cedar decking is naturally appealing like all decking options but is lower maintenance. It can also be stained and sealed. Not only do we boast two industry-leading wood deck options, we are also proud to be one of the most renowned decking companies in the area and have decades of experience in the industry. We always go the extra mile for our customers, helping them choose the best products to suit their preferences, and as proof of our superior service, we maintain an A+ rating with the Better Business Bureau. Contact Chesley Fence & Deck today to learn more about how a wood deck can improve your yard. We proudly serve homeowners throughout Beckemeyer, IL and all of Clinton County, including Germantown and Carlyle.